Excellent. 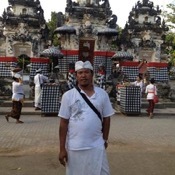 Putu took us around Bali for a day. Travelled as family of four - two daughters aged 10 and 12. He was punctual, friendly, knowledgeable and the car was very comfortable. Allowed us to customise our day as we went - saw traditional dancing (felt like local as 5% Western tourists which was great), local market (again non-touristy), Batik artists, lunch with rice paddy view, cat-pu-cino coffee (! ), and a beautiful 1000 year old temple. Great day all round. Lots of uncontrollable traffic though.